Successfully Added 2200mAh Portable Backup Power Supply For Cell Phones And MP3 Players to your Shopping Cart. 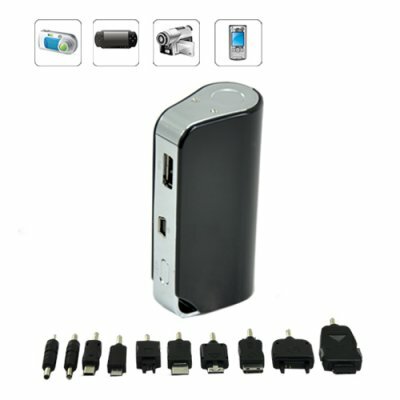 Introducing Portable Battery Charger for Mobile Electronics from Chinavasion. This mini battery charger gives you pocket-sized rechargeable power for your Cellphones, MP3s, MP4s, Digital Cameras, PDAs, as well as other mobile electronics. This convenient charger is perfect for use when you are on the go and does not need to be plugged into a power point, making it 100% portable. The Portable Battery Charger comes with 10 different charger adapters that cover all of today's major cellphone makers including Sony Ericsson, Nokia, LG, Samsung, Blackberry, etc. To charge other devices such as iPhone/iPod/iNano or MP3/MP4s, simply connecting the USB adapter cable that comes with your device to the USB port of the charger. The 4 LED indicator lets you know how much battery is left during charging process. When you are at home or in your office, connect the Portable Battery Charger to your computer or USB power adaptor to charge its internal Lithium-ion battery. Slip it into your pocket on your way out next time, and you now have the emergency back up power supply that can make your cellphone and other mobile electronics go the extra mile when needed. If you are looking for a quick and inexpensive way to make some great profit without a lot of effort, then the Portable Battery Charger for Mobile Electronics is definitely worth considering. It is portable, versatile and easy to use, similar items can cost as much as twice of our price. This great electronics gadget is in stock in our warehouse right now. Order a few today and we will express ship them by tomorrow. What kind of devices can I charge with this portable battery charger? You can charge most cellphones from all major brand, as well as your iPhone/iPod/iNano and other mobile electronic devices with USB charging capability. Well, in addtion to the iPhone and Blackberry, it is also compatible with popular models like the Motorolla MOTO V3,Sony Ericsson K750,Sony Ericsson T28, all Nokia's big and small round connector, and popluar Samsung models such as the 8600，A288， D800，G600，and LG models such as the LG KG90. Ordered it on Sunday and got it on Wednesday. Charges my iphone with ease, as well as my M56 odyssey.